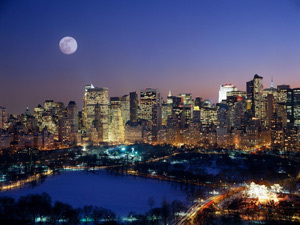 Manhattan is synonymous with power, wealth, and culture. People flock to Manhattan from around the world to begin new lives and launch their careers. From Broadway to Wall Street, images of New York City have been a part of most people's lives through popular culture no matter where they grew up. No matter where your interest lie, Manhattan offers something to excite. Culture aficionados could be entertained for a lifetime, with revolving exhibits at the Metropolitan Museum of art, the Museum of Modern Art (MoMA), the Whitney Museum, and the Frank Lloyd Wright Museum, not to mention the countless boutique galleries scattered around the city. Theatre Lovers will be thrilled by both the big shows and the off-broadway productions, many of which don't stay on the fringe for long. Our limo drivers have intimate knowledge of the locations of New York's iconic cultural hotspots, and will be glad to deliver you to each location without a hitch. It isn't just the culture lovers who think of Manhattan as mecca -- sports fans find their fair share of attractions as well. The New York Knicks, Rangers and WNBA Liberty teams all play at Madison Square Garden in Manhattan. Sports fans in Manhattan differ from those in most other areas of the country by bringing class back to the games. Style and sports go together in New York City, and arriving in an elegant New York Limo is one way Manhattan's elite bring sophistication to athletics. Manhattan is a place to see and be seen, whether it's for a celebrity studded movie premiere, a non-profit charity gala, or Fashion Week. Don't get stuck hailing a cab or taking the subway when you have to look your best. Arrive composed, poised, and coiffed after luxuriating against our sumptuous leather seats of a New York Limo. Our professional drivers will take you right to the red carpet so that you can make an entrance worthy of royalty. As the home to the United Nations, Wall Street, and the most corporate headquarters of any city in the country, Manhattan isn't just about having fun -- sometimes the fun is in getting down to business. When you need to get to the meeting of a lifetime on time; when an important client is flying in from out of town; when you need to make a statement through your arrival, New York Limo is on your side. Our business lies in helping you focus on yours without a second thought about transportation.